Click now to listen to the latest "On The Ropes" show! By Jenna Jay (Exclusive Interview by Jenna J, Doghouse Boxing). The PPV event between Julio Cesar Chavez Jr. and Sergio Martinez is now less than a week away, and both fighters are doing their final preparations for the fight. 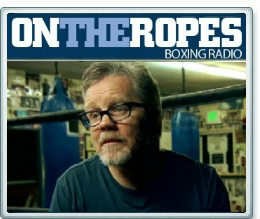 In part 2 of my exclusive "On The Ropes" boxing radio Interview with Freddie Roach, we discuss how the training camp has gone for the fight, Chavez Jr’s growth as a fighter, his thoughts on Sergio Martinez as a fighter, the game plan they have to beat Sergio Martinez, and his official prediction for the fight this weekend. Here is what he had to say. Jenna Jay: How has training camp gone for Julio Cesar Chavez Jr’s upcoming September 15th bout with Sergio Martinez? Freddie Roach: Going pretty well, Chavez Jr. was a little tired last night, so he took a day off and got some rest last night. He’s been working pretty hard and getting ready for the big fight. Jenna: Did you believe when you first started working with Chavez that he would become the fighter his is today? Roach: No, he was kind of raw and a little bit green, and he’s really come a long ways, he’s progressed well and he’s been working really hard, and the hard work really has paid off for him. He’s become a really good fighter. Jenna: Chavez’s last fight was against southpaw Andy Lee, and is considered by most to be his best performance. Can you me what you thought about Andy Lee going into that one, and how you felt everything went? Roach: Going into the fight, I knew Andy Lee. He was a good south paw, with a good left hand and power, had a great amateur background of course, and we were going in there with a few experienced guy, but Chavez just broke him down and just fought a very good fight. Chavez usually does not like fighting southpaws that much, but we worked really hard on how to handle a southpaw stance and the game plan worked very well. Jenna: Chavez Jr. has also been a great finisher in recent fights, is that something that comes natural to him or something that you have been working with him on? Roach: I think that comes more natural to him. Of course his father use to break fighters down and would finish very well also and I think he might of got that from his dad. Jenna: When you look at Sergio Martinez as a fighter, what do you see? Roach: He’s a great athlete, and while I don’t think he’s a great great boxer, he’s very athletic, quick and he does have punching power and he’s awkward with that south paw stance which can be difficult, and the movement can give you some difficulty. I think he is the most difficult fighter we have faced so far. Jenna: How does Chavez Jr. go about fighting the style of Sergio Martinez? Roach: Well the thing is, you have to nullify the speed, so you got to try and break him down to the body and you got to take his legs away from him, and pressure him quite a bit, but you can’t pressure him by just going forward, cause he does have that movement that he has and hides the left hand well, he tries to set you up and knock you with the big left hand. So he is a little bit difficult style wise but his patterns you can tell when he’s setting em up. He’s 38 years old, he’s a little bit older and he does not fight every round 100% because I don’t think his body will let him, so he does take rounds off and so forth and we are trying to identity when he’s resting, and when he’s trying to rest we are going to press him and make him fight those rounds as well as the test, and with the pressure we can get to him. Jenna: There has been a lot of talk between the 2 camps in the lead up to this fight, do you think the distaste that Chavez seems to have for Martinez is real or just promotion? Roach: No, I know Chavez doesn’t like this guy, and says he’s weak and is going to take advantage of it. So Chavez is working hard and he’s going to go out there and make this guy fight and be in for the fight of his life! Jenna: What is the most important thing for Chavez Jr. to do to come away with a victory against Sergio Martinez? Roach: The biggest thing is he can’t follow him, people get caught up in following Martinez, and if you follow Martinez he will walk you into the left hand and he’s very patient, he moves around a lot and gets guys to follow him and if you do follow him he will hit you with the big left hand and he does have knockout power, so that’s something we can’t do, and we got to cut the ring off, stay more directly in front of him and put pressure on him. Jenna: What do you think is next for Chavez Jr. if he is able to beat Martinez? Roach: He’s having a little trouble making 160, so I’d like to see him try and go to 168. There are great guys up there, Kelly Pavlik has been mentioned as a possible next opponent and stuff like that and I’d like to see him move to 168 next cause he will be a lot stronger and a lot more durable at that weight because he does have a little trouble making the 160 limit. Jenna: Final Question for you Freddie. What is your official prediction for the Chavez Jr vs. Martinez bout? Roach: Well I think we are going to press this guy and break him down and get a late round stoppage. He is dangerous and so forth, but we have a good game plan down and we are going to fight the best fight of our life.